The ACD work has global following from over 150 countries. 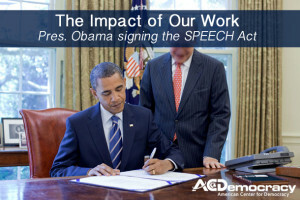 2010- “SPEECH Act”– It protects American journalists and scholars from enforcement of foreign libel judgments in the U.S. The Law passed unanimously by Congress. 2008- “Rachel’s Law”– “The Libel Terrorism Protection Act,” passed unanimously and by the New York State Assembly and enacted shortly afterward. Similar laws passed in 10 more states. Pioneering the Terror Network Finance Tracking (TNFT) – identification of terror financiers and facilitators, not listed by OFAC. The announcement of a Defamation Bill in the Queen’s Speech today (9th May) has been welcomed by campaigners from the Libel Reform Campaign. The inclusion of the bill in the speech, which outlines the government’s agenda for the next parliamentary session, confirms that the government intends to make changes to the legislation on defamation within this next parliamentary session. Although the contents of the draft bill have not been published, they are thought to include an end to libel ‘tourism’, a new public interest defence for publishers, measures to strike out trivial claims at an earlier stage, new provision for online publication and a single publication rule. Read this article by Harry Melkonian from the Media Law Resource Center Bulletin, August 2011. The defendants (the foreign plaintiffs) originally tried to defend the US lawsuit but later amended some of their answers, removed all of their affirmative defenses and subsequently agreed to a Stipulated Judgment. I would like to personally thank you for your tireless efforts in helping to bring about this important new law to protect American citizens and CDA protected websites from libel tourists. Read the judgment to which Mr. Lawrence refers. Read the paper presented to the OSCE Human Dimension Implementation Meeting in Warsaw, September, 2009. Presented on behalf of the International Civil Liberties Alliance, Pax Europa Mission Europa, and Wiener Akademirbund.